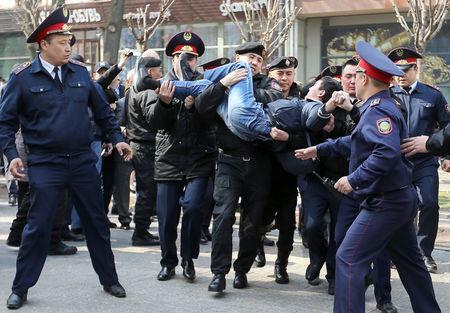 ASTANA (Reuters) - Police arrested dozens of opposition supporters staging rallies in Kazakhstan's two major cities on Friday, three days after the surprise resignation of veteran leader Nursultan Nazarbayev, according to Reuters witnesses. Nazarbayev resigned earlier this week, saying a new generation of leaders was needed. Senate speaker Kassym-Jomart Tokayev was made interim president. Nazarbayev's daughter Dariga Nazarbayeva was elected speaker in Tokayev's place. Nazarbayev's foe, fugitive banker and opposition politician Mukhtar Ablyazov who organised the protests, has accused the 78-year-old politician of planning a dynastic succession that would see his daughter succeed him. Friday's rallies in the capital Astana and in Almaty, Khazakstan's biggest city, were small, with dozens of participants. A similar number gathered on Thursday, the first day of the protests which seem unlikely to pose a threat to the government led by Nazarbayev loyalists. Protesters in Almaty carrying blue balloons - the emblem of opposition - mixed with crowds attending Nowruz festivities, a regional pre-Islamic holiday celebrated on the spring equinox, and soccer fans saluting Kazakhstan's surprise victory over Scotland. Although there were no slogans, chants or banners, some participants shouted they opposed Astana's renaming. Tokayev, who assumed presidential powers until the current term ends in April 2020, said on Wednesday that Astana, the capital, would be renamed Nur-Sultan in Nazarbayev's honour. Police, including officers in full riot gear, quickly detained virtually all the protesters who shouted "Shame!" as they were bundled off. 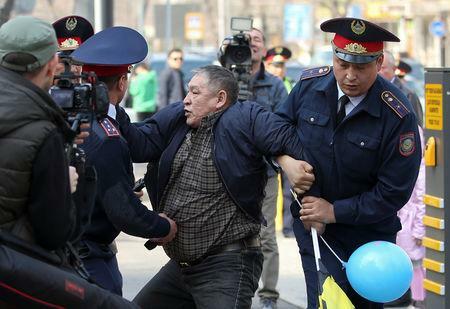 Public rallies are illegal in Kazakhstan without the authorities' permission. 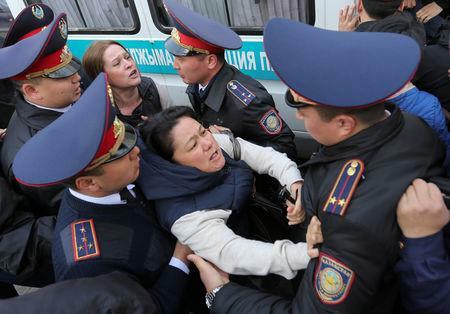 On Thursday around 20 people protesting against the renaming outside Astana mayor's office were also detained by police.